A lively new picture-book biography of the most beloved children's book author of all time: Dr. Seuss! Have you ever wondered how the great Dr. Seuss wrote his most famous book? Did you know that for The Cat in the Hat, he wasn't allowed to make up the fun words he was known for--like OOBLECK and IT-KUTCH and HIPPO-NO-HUNGUS? He was only allowed to use words from a very strict list! This bouncy account of the early career of Dr. Seuss (a.k.a. Ted Geisel) proves that sometimes limitations can be the best inspiration of all. Kid-friendly prose (with Seussian rhyme for Ted's dialogue) and whimsical illustrations by award winner Kevin Hawkes recall the work of Dr. Seuss himself. Writing tips from Dr. Seuss and exclusive letters from the author and illustrator, detailing how they created this book, are included! I love a book who's description starts with 'Have you ever wondered...', there is just something about those four words that will hook me, and honestly my children, every time. Now 'IMAGINE THAT' it said "Have you ever wondered how the great Dr. Seuss....stop right there! Do you honestly need any more? Have I ever wondered ANYTHING about Dr. Seuss, more like have I ever wondered EVERYTHING about Dr. Seuss! Dr. Seuss is I believe for most of us likely to have been the very first author we ever read all by ourselves, his books told us, showed up that we can do it, WE CAN READ with out help. He is likely the start of many of our book obsessions and honesty you never grow out of loving a Dr. Seuss book, his books call to me even to this day, if I see one I can't walk by with out picking it up and flipping through the pages. A Dr. Seuss book can brighten us on our dark days, will make us laugh and smile even if you have read the book a hundred times...I could go on and on, but this isn't a review of Dr. Seuss himself but of a little biography about a point in Dr. Seuss life and how this one little book of his that was a great big challenge ultimately has changed all of our lives forever. 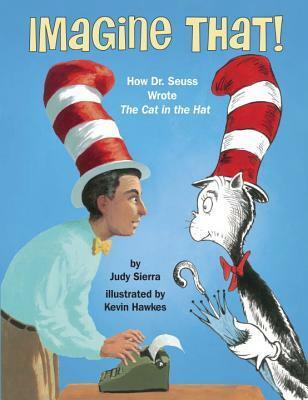 Imagine That is a wonderful children's biography revolving around the development of Dr. Seuss's iconic The Cat in the Hat. Did you ever wonder how or why The Cat in the Hat came to be, did you know that The Cat in the Hat changed everything about the way children learn to read. Did you know that Dr. Seuss and The Cat in the Hat have a favorite accessory in common? Did you know that Dr Seuss, of all people, had to follow special word rules when writing The Cat in the Hat? I loved this book for all the little tidbits and history that it gave me in a a mere 40 pages, and not only that but the wonderfully inviting art on the pages. I loved that this little biography about Dr. Seuss and The Cat in the Hat is more that just facts, there is an underlying story of never giving up. A tale for children to read and be reminded that things are not always going to be easy but if they put their mind and heart into it they can accomplish great things. It is a book that would be the perfect fit for any budding writer, little or big. It is a fantastic book to have in your classrooms, I'd say from Pre-K to 3rd grade and on library shelves for any age. It is the perfect book to read during Read Across America. What better book to add to your Dr. Seuss collection than a wonderfully written and illustrated story about how Dr. Seuss wrote and changed our reading lives with The Cat and the Hat! I took the long-cut to being an author. Out of college I did temporary work in offices and libraries, while at night, I wrote poetry and made strange life forms from cloth. When I teamed up with a puppeteer, Bob Kaminski (my husband), I was able to bring my cloth creations to life. We began performing on the streets of San Francisco, at Renaissance fairs, and at schools. After attending a workshop on Balinese shadow puppetry, we traveled to Bali and Java to learn ancient techniques from modern masters, and we adapted material from American folklore to the shadow screen. I became so fascinated by the power of ancient myth and folktale to engage a modern audience that I enrolled in the Folklore and Mythology Program at UCLA, where I received my Ph.D. While I was a student there, I attended a talk by the author-illustrator Uri Shulevitz, and heard him say that a picture book is like a small theater. A puppet theater is also a small theater, I thought. I can do that! 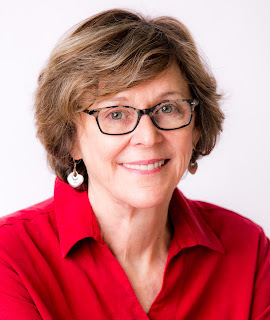 My first children's books were adaptations of folktales, and soon, I was able to incorporate my lifelong habit of writing poetry into my work. Currently (Spring 2014), I live in Eugene, Oregon, with my husband. I divide my writing time between children's books and a long term project on folktales, grandmothers and cultural evolution. Kevin Hawkes is the illustrator of over 35 acclaimed picture books and chapter books including Library Lion, The Librarian Who Measured the Earth, Weslandia, and Sidewalk Circus. His vibrant colors, unusual perspectives, an dry sense of humor are hallmarks of his work. He lives with his charming wife and children in Southern Maine where he is often found wandering aimlessly in his garden. When forced indoors, he works quite happily painting cobalt blue skies, imaginary landscapes, and flying pianos.